A new study has revealed which Premier League players have been paid the most and least per minute of action so far in the 2018/19 season. TheSportsman.com has conducted the study, which runs from the start of the season up until Monday, February 11. The study has deducted weekly wages from players for the weeks they have been out injured, then divided their collective earnings during the course of the campaign and divided it by the minutes they have played in the Premier League this season. The highest paid player, according to the study, per minute of Premier League action this season is Crystal Palace's Papa Souare, who has earned £630,000 for his one minute of game time. The left-back earns a reported £30,000 at Selhurst Park. Fellow Eagles player Scott Dann is next, with £480,000 for his one minute of Premier League action. The defender has only recently returned from a knee injury and earns a reported £60,000 per week. In third place is Tottenham winger Georges-Kevin N’koudou, who has earned £218,750 for each of his four Premier League minutes. Chelsea defender Gary Cahill has earned £123,810 for each of his 21 minutes and fellow Blues defender Davide Zappacosta has collected £101,111 for each of his 18 minutes. Jermain Defoe, who is now on loan to Rangers from Bournemouth, picked up £98,759 for each of his 22 Premier League minutes for the Cherries this season. Victor Moses, who is now on loan to Fenerbahce from Chelsea, earned £66,346 for each of his 26 minutes in the top flight and Watford defender Miguel Britos has picked up £50,000 for each of his 13 minutes. At the other end of the table, Declan Rice was earning just £38 per minute of Premier League action until he signed his new contract with West Ham in December. The midfielder was reportedly on £3,000 a week and had played 2,026 minutes in the top flight. Fulham defender Denis Odoi has earned just £109 per minute of Premier League action, while Wolves wing-back Matt Doherty has collected £117 for each of his 2,219 minutes of top-flight action. They are followed by Ryan Sessegnon (£142 per minute), Sol Bamba (£162 per minute), Conor Coady (£167 per minute), Aaron Wan-Bissaka (£174 per minute) and Philip Billing (£204 per minute). According to the study, Brighton striker Florin Andone has earned the most per minute at the Seagulls. The Romanian is reportedly on £40,000 a week and has earned £1,948 for each of his 534 minutes. 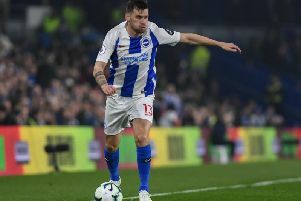 The lowest paid Albion player per minute of Premier League action is left-back Gaetan Bong. The Cameroon international has reportedly earned £339 for each of his 1,535 minutes in the Premier League. The most paid to players who have not featured in the Premier League this season is to Chelsea midfielder Danny Drinkwater (£2,000,000), Lazar Markovic, who moved to Fulham from Liverpool in January, (£1,950,000), Southampton goalkeeper Fraser Forster (£1,820,000), Manchester City's Eliaquim Mangala (£1,600,000) and Liverpool goalkeeper Simon Mignolet (£1,560,000).